I bought this product because I love trying new things, and I do enjoy the shredded and block cheeses from this company. My first disappointment came when I opened the box. There was another package for the pasta inside. These days I am working on being more conscious of my waste footprint by making an effort to avoid buying products that have a lot of unnecessary extra packaging (for example, individually wrapped toilet paper). So it was disappointing to have to open (nevermind throw away) another package just to get to the pasta. The instructions were clear and easy to follow, for the most part. I almost missed the "drain" step because of how their instructions are formatted: one column with the verbs and the other with the rest of the sentence (for example "cook" and then "for 7-8 min"). But in the "drain" step, the sentence next to it is not the rest of the sentence (like "pasta using a colander") but rather another step ("return to sauce pan"). In my opinion, that verb ("return") and the rest of its sentence ("to sauce pan") should be in a new row. The other thing I noticed was how smaller the macs were when compared to regular original Kraft Mac and Cheese (from what I remember - it's been years since I've had it). However, after mixing the cheese, they did look just like the original one. Looking at the package, I was disappointed to notice that it has refined sugar (and wondered why I had bought this product if that was the case). But since it is listed as 0g in the nutritional facts, I thought it might be ok (and maybe that's why I bought it). I was wrong. Hours after eating it I kept getting the same addictive urge from my brain that I get when I eat refined sugar: I want to have "more, more, more". It was disappointing because their cheeses don't have refined sugar. I don't know why they decided to add it to this product. The cheese sauce itself didn't taste completely creamy. I felt some grains in my mouth (like when you put a but too much cocoa powder in your milk and it doesn't all dissolve). Or maybe I just didn't keep it in the pan for long enough? It does taste almost the same as the Kraft M&C (from what I remember). But that also means it still tastes kinda unhealthy, artificial, chemical. 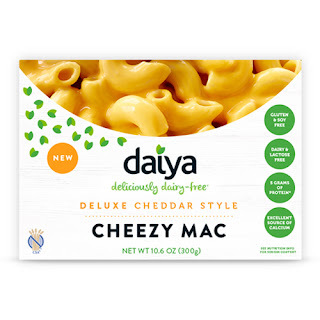 I think if I just buy the separate mac and put their own cheese into it, it will taste better than this product - and wont have sugar. Either way, I wont be buying this product again. I'm sad to give such a bad review because I do like this brand. But I have to be honest with my readers and myself.